To get to the Miho Museum in Japan, visitors drive for an hour or so from Kyoto, up a long, winding two-lane road into a nature preserve in the Shigaraki Mountains, or take a train to Otsu, the capital of Shiga prefecture, then a long bus ride following the same path. For many weeks of the year—winter, rainy season in June and part of the hot, humid summer—the museum is closed in deference to the potentially treacherous weather. And the Miho stands alone, with no neighboring services or attractions. Not even a place to eat, except the museum restaurant. Getting there is a journey. The Miho, which was built by Mihoko Koyama (who died in 2003), founder of Shinji Shumeikai, a religious sect, started out with a much smaller goal. Koyama collected Japanese tea-ceremony objects and wanted to share them with the public. But when she hired I.M. Pei as architect, the vision expanded exponentially. Advised by him to collect internationally, Koyama and her daughter-successor, Hiroko Koyama, went on a shopping spree. Over six years in the 1990s, aided especially by dealer Noriyoshi Horiuchi, they amassed more than 2,000 objects from ancient Egypt, Greece, Rome, the Middle East and Asia, especially China and Persia. Meanwhile, unimpressed by the site he was offered, Mr. Pei chose a different location, on a ridge overlooking a valley, then had to work with stipulations forbidding tall buildings and requiring a roof that harmonized with the surrounding slopes. So he dug up the mountain, placed some 80% of the building underground, restored the landscape's original contours, and designed peaked glass roofs that admit light into the lobby and other public spaces. He created a transporting entrance that takes visitors along a sloping road lined with cherry trees, through a stainless-steel-lined tunnel, over a graceful suspension bridge that spans a deep gorge, and up steps to the museum. 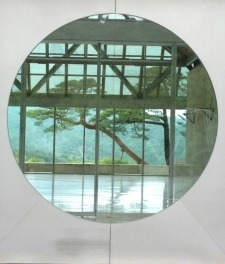 Through a large glass moon-gate in its doors, they see past the entrance hall to the valley and mountains beyond—a "borrowed landscape" scene that is enhanced by three 150-year-old pines Mr. Pei had transplanted to the foreground, as graceful as bonsai. Beyond this stunning entrance, Mr. Pei has fashioned equally inspired galleries. Each is unique, of a different shape, size and muted color, subtly signaling to visitors that they are moving from one ancient land to another. Within each, he created spaces that showcase the most important objects. 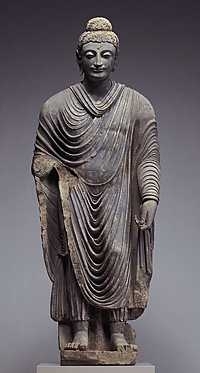 That Buddha, one of a handful of such images of that size, stands against a red background beneath a skylight. 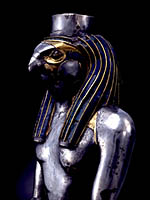 The falcon-head deity occupies a small room almost of its own, with just two pieces nearby. Made of solid silver, cloaked with traces of the gold it once wore, and adorned with crystal eyes and lapis lazuli hair, the muscular god sits in a vitrine (also designed by Mr. Pei) a few feet away from a deep-blue wall that shows it off brilliantly. A trio of fresco panels of a Roman garden, dated the first century A.D., hangs in a gallery that looks like a terrace with steps leading down to the "garden." This match of form and content was possible partly because the buying was taking place as Mr. Pei designed. Even when the building was almost complete, he knocked out the ceiling of a Persian gallery to accommodate a late-16th-to-early-17th-century carpet that had hung in the Metropolitan Museum of Art since 1954, on loan. When in 1994 the owner, a prince in Poland's Sanguszko family, decided to sell, the Miho leaped at the colorful, rare, 19½-foot-long medallion-and-animal carpet, even though it had no plan to collect rugs. Not every item in the Miho's collection is as rare as the Buddha or the carpet. But the Koyamas had beauty in mind when they made their selections (they believed that art, beauty and nature can nourish the soul). From a 5-foot-tall statue of Arsinoe II to Iranian gold beakers decked with vultures, gazelles, bulls and raptors, to a gilded-silver drinking cup that ends in a caracal cat clutching a cockerel—all 2,000 to 3,000 years old— to a Roman floor mosaic of Dionysus, an elegant bronze Eastern Han tomb figure of a horse and a Buddhist votive stele, all just a bit more recent, this collection is simply splendid to look at. The installation is also filled with great moments, such as a face-off between that Han horse and a more elongated golden horse made in Mongolia 300 years earlier. Some pieces looked so good, in fact, that the Miho's 1998 opening was marred with rumors of fakes and questions of provenance. The museum has put to rest most of the former, enlisting experts to vouch for authenticity (or removing those that did not pass muster). Its life-size wooden statue of Nakht, a priest and astronomer from Egypt's Middle Kingdom period 4,000 years ago, for example, was viewed as too pristine, too naturalistic, among other things. But the paint and the wood, subjected to testing, were consistent with the dates, and scholars at the Cleveland Museum of Art studied the piece and agreed with its authenticity. Some pieces still lack provenance, and a few are still disputed among scholars, but such disagreements are not unusual in the museum world. The Miho continues to add to its collection in a small way, and it frequently mounts special exhibitions in a separate wing to add to its appeal. But for this cultural tourist, at least, what it has on view in its permanent-collection galleries is already worth the trek.